Organizers of the College Football Playoff National Championship are using Super Bowl XLIX as a blueprint as they prepare for events surrounding their game, scheduled Jan. 11 at University of Phoenix Stadium. The Super Bowl brought in more than $700 million to the Valley, according to a study from the W.P. Carey School of Business at Arizona State University. The Arizona Organizing Committee for the college championship game is hoping to achieve a similar level of success come January. 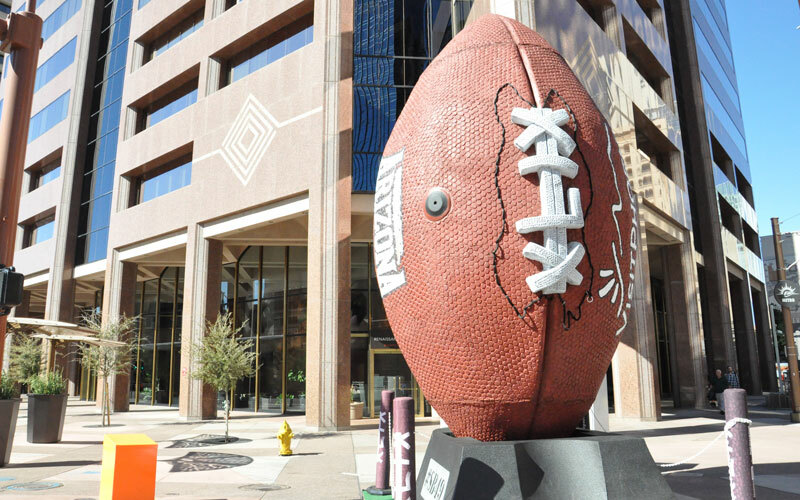 The Championship Campus is an indoor and outdoor fan experience in downtown Phoenix, similar to Super Bowl Central. Playoff Fan Central will be held at the Phoenix Convention Center with an outdoor stage nearby for live music events, along with interactive fan activities, food, games and more, all in a three-day period leading up to the game. Championship Campus is slightly smaller than Super Bowl Central, at eight city blocks closed off compared to the 12 blocks closed for the Super Bowl. Like Super Bowl Central, Championship Campus is free to enter, but Playoff Fan Central at the Championship Campus will cost $12 for adults, $7 for children, seniors and military, and $5 per person in groups of 20 or more. That’s cheaper than Super Bowl Central’s NFL Experience, which cost $35 for adults and $20 for children 12 and under. The CEO program aims to attract up to 50 CEOs of targeted companies from around the country and entertain them in Arizona for the game, showing them why the Valley is a great place to operate a business, to live and to work. A similar program during Super Bowl week brought in about 60 CEOs. Local cities have worked together to successfully bid on large events like these for Arizona. It has been a long process of setting up and preparing for the arrival of the madness that will be the College Football Playoff National Championship and Glendale has been involved the entire way. Glendale, Phoenix and other Valley cities have worked together to attract these major events to Arizona. The team effort presents an overall greater picture and more to offer than if one city tried to go it alone. 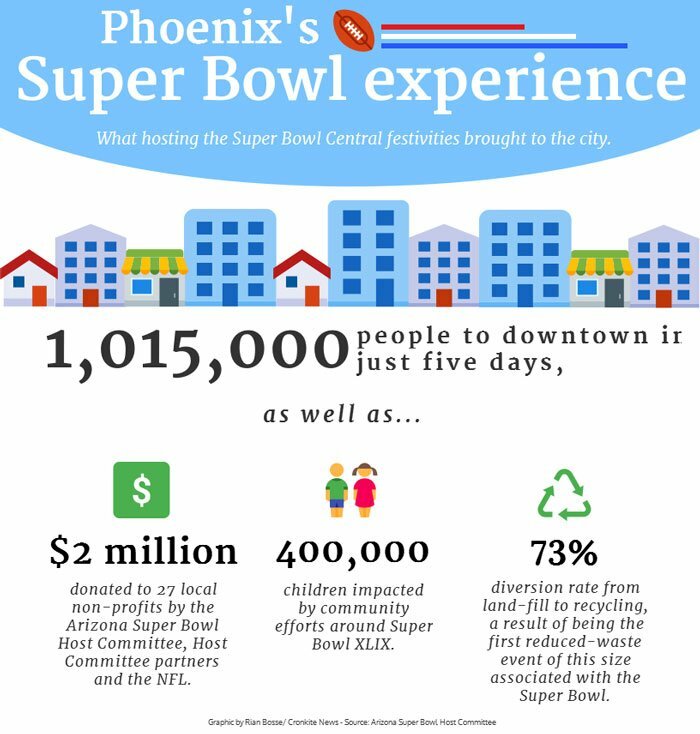 Super Bowl XLIX also spread events across Scottsdale, downtown Phoenix and, of course, Glendale for the game itself. It allowed visitors to get a good look at some of what Arizona had to offer, just like the College Football Playoff National Championship will. “From our perspective, what’s really unique about what our region has to offer is because even though we’re in different cities, we have the best of both worlds to offer these folks that are looking for places to come in and host these major events,” Moreno said. University of Phoenix Stadium can seat about 72,000 people and Debbie Johnson, director at the Arizona Office of Tourism, said they’re expecting another 25,000 to 40,000 people outside the stadium participating in the tailgate and other activities around the Westgate Entertainment District. While the college championship game has brought the same intensity and event preparation as Super Bowl XLIX, those involved say the college game has a flair that the Super Bowl could not provide.